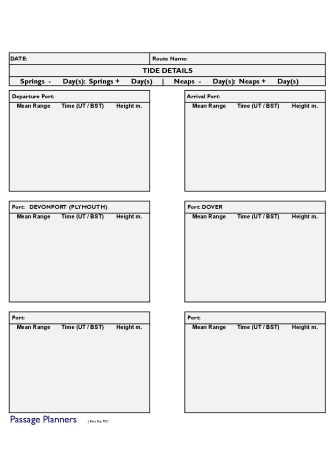 This form is used with the other forms for Passage Planning, Pilotage Planning and Ports of Refuge Planning. The Tide Details Form has entries where you indicate the day's tides for ports along the route of your passage/pilotage. Note that this form also has headings for the ports of Devonport (Plymouth) and Dover, both ports featuring as Reference Ports in many tidal stream and other planning calculations. Presented with the Tide Details ContinuationForm on the reverse side, the forms are heat encapsulated within a premium matt plastic A4 size pouch which allows for details to be written using a 2HB pencil. Tide details may be altered as required, by erasing with a pencil eraser, and re-entering new data. There is plenty of space in each box to allow easy entering of detail. Use time and time again. 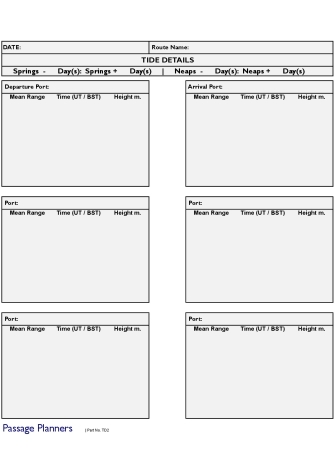 Forms to help you quickly plan the tidal details for your passage as part of your passage plan. This is encapsulated on the reverse of the above Tide Details Form without the addition of the Devonport (Plymouth) and Dover ports. Details can be erased and reused for the next passage plan. Click to link to our Tides link page which will allow you to get tide times for free. Page will open in a new tab.